Recently I have reviewed a lot of e-Learning courses to get ideas for our further product development of easygenerator. One of the things I noticed was that learning objectives often play a secondary role or no role at all. Most of the time they are only anchors to attach scores to, so you can measure if somebody has successfully completed your course. In easygenerator learning objectives are present, but they don’t have a prominent place. I was quite surprised about that. Originally I was a teacher for economics and social studies and especially for social studies we often created our own lessons and learning material. The first thing they taught me when I was training to become a teacher was that you always start with your learning objectives. The other thing that I noticed is that sometimes it wasn’t clear at all how the course and objectives relate to the working place or life problems; often it isn’t clear what problem the learning wants to solve. Then it suddenly struck me that you could match the principles of output management to (e-)learning. There is a great book on about output management by Filip Vandendriessche, which is my ‘management bible’. I wrote a blog about output management some time ago. With this post I try to apply his output principles to learning. If you want more information on the original, you can read my blog, go to the output management site or buy his book (which I really recommend). 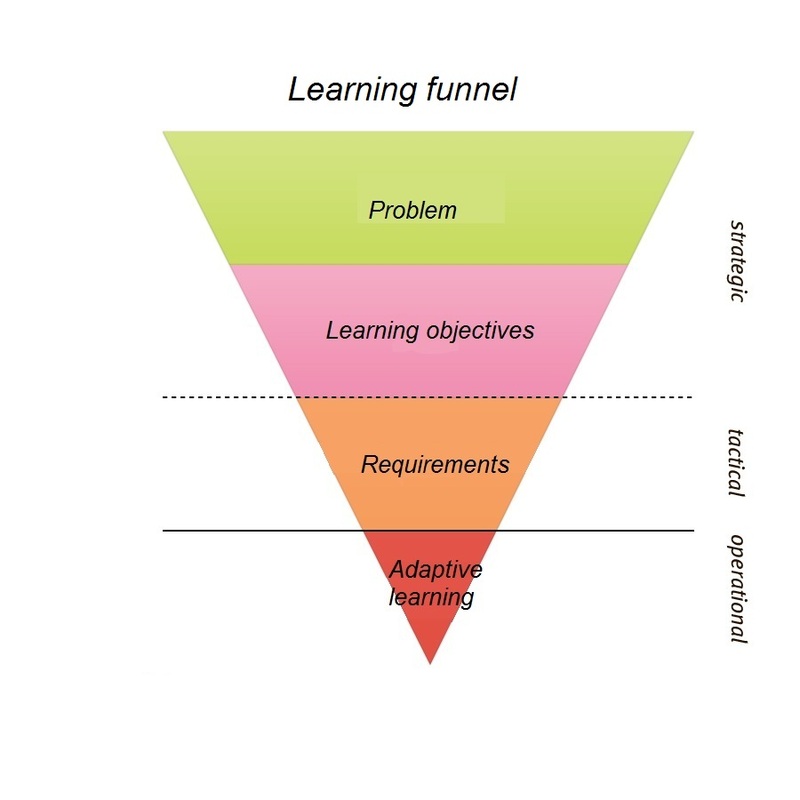 The funnel is a funnel because the manager/teacher is authoritarian on the strategic level, less authoritarian on a tactical level and must ‘let go’ on the operational level. Motivation is an important precondition to learning. People are often motivated by their natural curiosity and their need to develop. In the corporate world this is not always the case, we have to motivate the workers to become learners, they often need a reason for wanting to learn something. In this case the start of learning can be a problem that they encountered during work. When you are not able to do a certain task, either through lack of knowledge or lack of skills or anything else that is a problem. The first step is that people need to admit that they have a problem. After this we can take the next step. The problem might be solved by having better equipment, but a lot of the times the solution will involve a learning process. When learning is the answer you need to define learning objectives. They are the flip side of the problem, it is the desired output in terms of learning needs. Learning objectives are often a set of sub-objectives, written in more detail than the problem. Learning objectives must make sense to the learner: “I need to be able to do …. in order to achieve …. “. Measuring success is easy: You need to be able to apply what you have learned in practice and thus solve the problem. When people accept that they have a problem and they do accept the learning objectives they are motivated to solve the problem, it has become their problem. Motivation is one of the most essential parts of learning. Both in corporate learning and in our educational system we often forget this. It’s better to motivate your learners than to control them! The next step is to set requirements. As a manager/teacher you do not only want the problem to be solved, you want to set certain boundaries in reaching that solution. Requirements can deal with time, budget, quality, support et cetera. On the tactile level you are less authoritarian than on the strategic level. Certain negotiations might be necessary. The requirements need to be acceptable to both manager/teacher and learner. When a learner does accept the problem, the learning objectives and the requirements he will be committed to solve the problem within the set boundaries. Because the learner is now committed and motivated all solutions to the problem the manager can lay back. All solutions are acceptable as long as they meet the requirements and solve the problem. The learner is free in choosing his way of solving the problem and reaching the learning objectives. There are many ways to acquire the desired knowledge, skills or insights. We offer often just one way of learning (a course or a class) but we need to facilitate more learning paths with very different solutions. It might be the best solution to have a skilled person show the learner how it works, and all we need to do is connect those two people. In Filips theory this is called conflict pyramid. The chances to have a conflict on an operational level are far bigger than on a strategic level. There are always more solutions (learning paths) to one problem, and it is arbitrary which one is best. On a strategic level the chances of a conflict are way smaller. When you can’t execute a designated task, you have a problem, it is that simple. 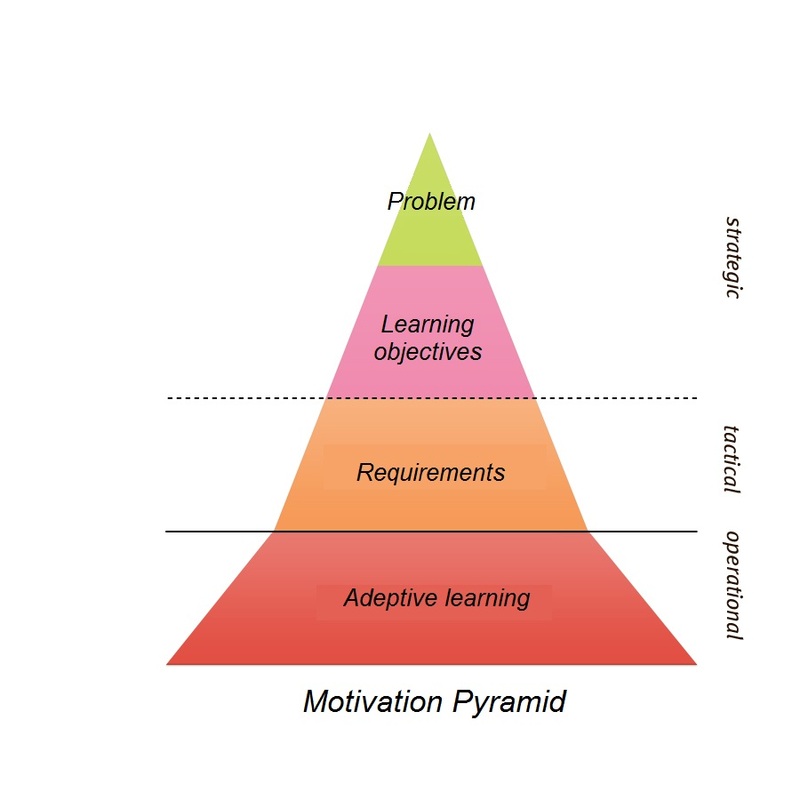 I renamed the ‘conflict pyramid’ to ‘motivation pyramid’ because avoiding conflicts is not enough for learning, you need to motivate the learner. The essence of this is that motivation will increase when a learner can create his own (learning) path to the solution. Because the boundaries are given the manager/teacher can let go. The proof of the pudding is in the eating, so does the solution the learner came up with, solves the problem within the given requirements. Writing this post created some new insights for me. I have to develop these ideas further but I think they can help in steering diffuse learning processes like social learning and informal learning and it does give more direction to adaptive learning then just ‘let go’. I was looking for a new term to capture our activities in the learning field; the term e-learning becomes outdated. ‘Output learning’ might be an option. 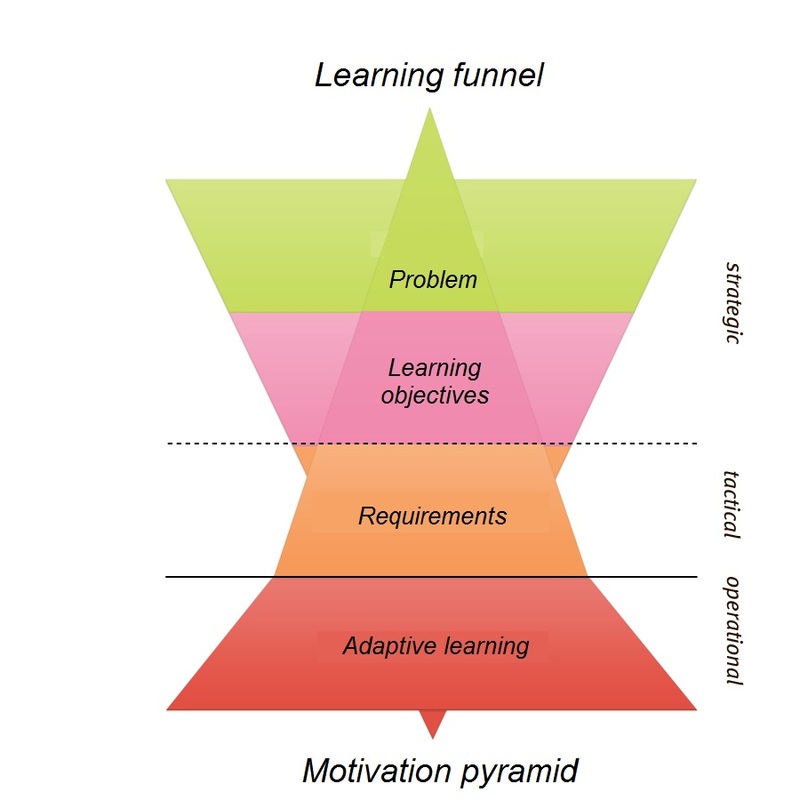 I like that it describes the content and the process instead the medium like e-Learning does. English: Leading without commanding (Published in-house), French: Diriger sans imposer (Eyrolles Paris 2008) and the Dutch version, Leidinggeven zonder bevelen (Lannoo 2011).